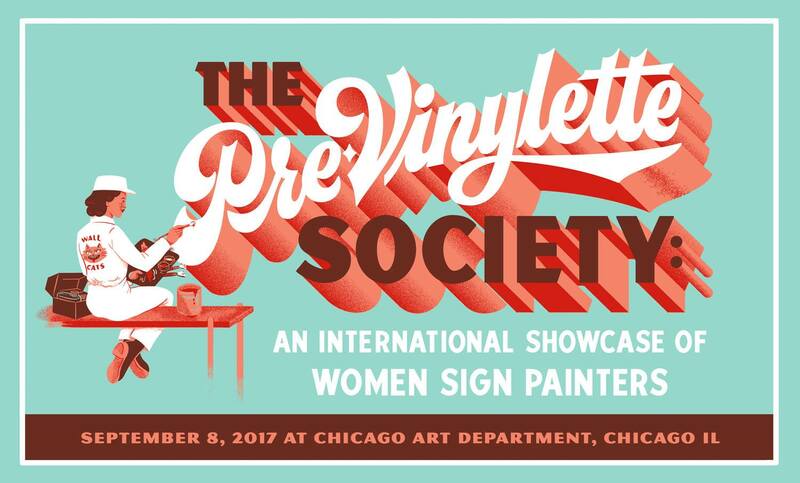 If you happen to be in the Windy City over the next few weeks, you’re going to want to head over to the Chicago Art Department to check out The Pre-Vinylette Society: An International Showcase of Women Sign Painters. Opening on Friday, September 8, the exhibition features the work of over 60 women sign painters from the United States, the UK, Canada, New Zealand, Australia, Scotland, Ireland, and Norway. My favorite sentence from the exhibition description: “The name of our show—the Pre-Vinylette Society—is a tongue-in-cheek re-appropriation of the grammatical “ette” suffix, which typically denotes a female or smaller version of a male or more substantial (read: better) thing.” That sounds about right. I heard about the exhibition while lurking on the popular Sign Painters Support Group on Facebook where over 3,000 members go to get shellacked in criticism, or watch others get shellacked in criticism, by master sign painters. It’s not a place for niceties and I do respect the overall goal: candid and constructive criticism to improve one’s craft. I’ve learned a lot by watching and listening and it’s probably one of the most honest places to find design criticism on the internet. However, as with most of the internet, well-intentioned spaces sometimes turn into troll farms. An innocuous post by Michelle Nguyen (one of the participating artists) announcing a sign painting exhibition, devolved into a defensive, chest-beating tirade that continues to grow. While some in the group have asked why an all-women sign painting exhibition is even necessary since those with any lettering chops are blind to gender, race, or any other “filter”. But if one needs further proof that skilled trades like sign painting have been historically dominated by white guys and less accessible or welcoming to anyone else, the reaction to this post might be the best testament for the exhibition’s existence. Also, I’ve found my new internet crush: Darla Dee Hagensick, a sign painter whose work is in the exhibition and is an all around badass lady. The exhibition runs from September 8–28, 2017 with an opening reception on Friday, September 8, 6–10pm and a Pre-Vinylette panel discussion on Saturday, September 9, 2–4pm. More information is here. Thanks so much for this post!! My name is Meredith Kasabian and I’m the co-curator of this show, along with my partner Shelby Rodeffer. There is a lot to consider when thinking about historically male fields and who holds the authority in those fields to say what’s “good” or “correct.” Women (and POC) have been historically denied access to the apprenticeships, trade schools, unions, etc. that set the standard for sign painting in its heyday and have been largely absent from many conversations, even to this day and especially in that toxic Facebook group you mention. In my experience, the trolls and generally negative and discouraging voices are always men’s and the encouraging and positive ones are almost exclusively those of women. I think it’s an issue of empathy that far exceeds the confines of any trade or practice. As they say, when you’re accustomed to privilege, equality feels like oppression. Thanks again for writing this post and for your interest in the show! It was a huge success and will not be the last you see of the Pre-Vinylettes! !